The postcard representative of Bonito, the Gruta do Lago Azul is a stunning cave having a radiant underground lake and enormous stalagmites and stalactites formations. Situated at a distance of 21 kilometres from Bonito, an excursion to the cave is usually undertaken through local guided tours. Exploring this magical cave is a must do while on your trip to Bonito. Wearing a safety helmet is a must and is provided by tour operators. Wear sturdy shoes and don’t forget to apply bug repellent. One of the busiest attractions in Bonito, it is advised to book a tour atleast a couple of weeks in advance. The mentioned ticket price is a rough estimate for a half-day excursion. 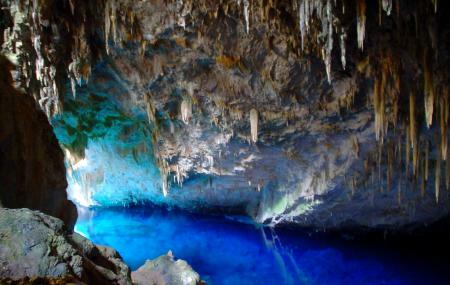 It is recommended to visit Gruta do Lago Azul between 9:00 am to 1:00 pm. How popular is Gruta Do Lago Azul? People normally club together Projeto Jiboia and Gruta De Sao Miguel while planning their visit to Gruta Do Lago Azul. People also prefer to start their day with Gruta Do Lago Azul. This cave is seriously amazing. It's advised to get on an early morning tour or better yet, the tour which starts about 8am so you'll be in the cave at the 830-9am mark which is when the sun shines through the opening at the right angle to light all the water up and you see the stunning blues! There is a great gift shop with some great Brazilian made items and a small canteen for drinks and snacks. The toilets are actually amazing which was unexpected for the remote location of the caves (you'll need good transfers I recommend a private driver to help get you there on time). The road is gravel and if it rains it would be pretty impassable - not so many good 4wd car options here. The tour is a short walk in the bush and then the 300 stairs down which are slate and abit slippery if it's rains. The guide was great and made a really great attempt at helping explain some complex rock formations/science in English. There is just the one large cave you walk to the bottom but then just back out again. You won't be able to touch the water or anything. Wear hiking/sports gear. Amazing place, but wouldn't be my first choice of tours.. short tour somewhat crowded. The tour consist of walking down a bunch of stairs into the gruta to look at the blue water.. the gruta and water are both beautiful, but there isn't much else to look at. Excelent trip. It's just very fast. It takes around 1 hour. Lovely experience that you should add to your Bonito itinerary. Note there is a special time of year early in the morning that you can see the cave in its glory, but it was still a site to behold. Note: the cave is very hot and humid! Amazing water falls. Fantastic scenery and the set up is well thought out.